The past couple days, we've been working on enhancing our popular Metro Themes, mostly focusing on refinements and improvements to their use in our Docking/MDI product. Our Metro Light, White, and Dark themes have been available since v2012.2 and not only theme the Actipro controls you use in your projects, but also can theme all the native WPF controls. This allows your entire app to mesh together cleanly with a polished, professional appearance. Lighter dock site background that blends better with the window background. Subtle outline borders around the tabbed MDI and tool window containers. Tool window container title bars are no longer as in-your-face when not focused. Tool window container title bars now have a dotted region that help relay that they are grippable. 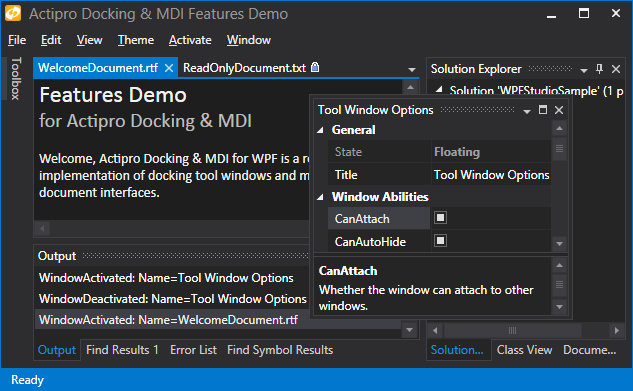 New auto-hidden tool window tab appearance that is more like Visual Studio 2013. Tool window tab images hidden by default in Metro themes (but can be toggled back via a new option). Slightly lighter control backgrounds in Metro Dark theme. 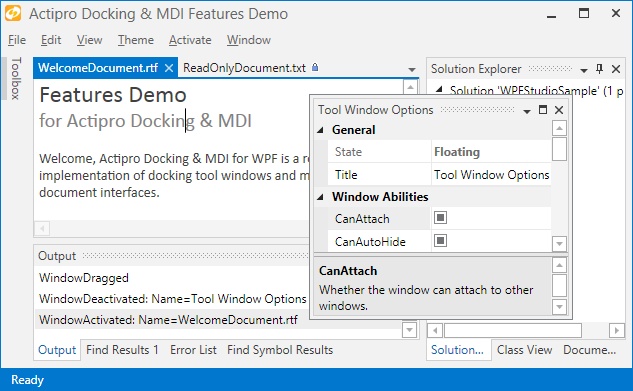 Our feature rich Docking/MDI product, combined with our enhanced Metro themes, really provide sleek and clean docking window functionality for your WPF apps. You won't beat the attention to detail that our themes provide.